UPS WorldShip has released version 14 that is an improvement over UPS WorldShip version 12, which was released last year. If you are shipping via UPS require international shipping, this is the only UPS based solution for your Multichannel Order Manager. If you are doing a new install of World ship, this guide will walk you through the installation process and help you correctly map you system. To access the UPS WorldShip 2011 guide, click here. If you are already using UPS WorldShip version 12, when you upgrade UPS system, the mapping for your M.O.M. system should update automatically. 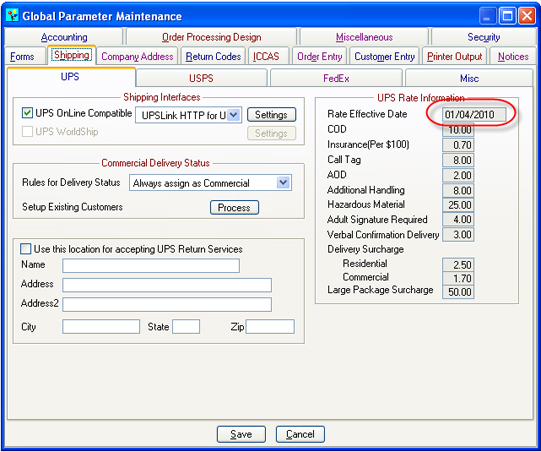 UPS WorldShip is one of the many shipping integrations offered by Dydacomp for our Multichannel Order Manager system. If you run into any issue installing or upgrading WorldShip for your Multichannel Order Manager System, please contact Dydacomp Technical Support at (973) 237 0300 or through the online ticketing system. When the customer explained the issue, the first thing I checked was the date of the last shipping rate update. As I suspected, the rates were showing 2009. The customer was very relieved and appreciative that the resolution was this quick and easy. To prevent issues like this one, you can log into the Support section of our website and check to see if there are updates available with a more recent date than the one that appears in your Global Parameters. In speaking with some of our customers, they have told me of their experiences calling other companies’ support lines for other products that they use in their business. Much to my surprise, some of these companies are widely known global companies, yet the customer was surprised how unhelpful they were. When I look at what M.O.M. Support has to offer, and knowing that supported clients, year-over-year, are doing 23% better from a sales standpoint than those that are not supported, I can’t see any reason why a client would go without a Support contract. There are several new Support options available that make it even easier to get the support your company needs. We are not “perfect”, but overall, we’ve been making significant advances in helping our customers and meeting the needs of their businesses.